You are working in Civil 3D. You grip a point, drag the label, get a leader, it all looks good until you drag the label to the left side of the point. 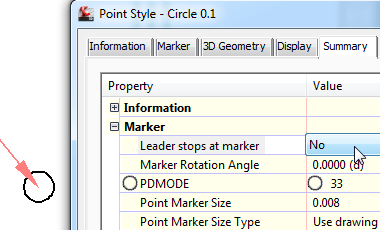 In this post we will follow the steps necessary to edit the point label style to get the leader to look right on both sides of the point marker. The drawing template, _AutoCAD Civil 3D (Imperial) NCS Extended.dwt found in Civil 3D 2009 (a long time ago) has a point label style called Point#-Elevation-Description. All point label styles have a Dragged State, meaning you grip and drag the label away from its home position. The Dragged State has settings that control how the label is displayed when not in its home position. Use the Copy button to copy the Point Description before deleting the Point Description at the top of the list. To illustrate the Leader stops at marker setting. Is there a way to get rid of the gap between the arrowhead and the “crosshairs” that represent the point? The distance of the arrowhead from the point’s insertion has no user controllable settings. (strike that. see below) The symbol in the Point Style has “limits” like an invisible force field around it. The perimeter of this “limit” is where the 9 attachment points are located (Middle Right, Top Right, etc.). 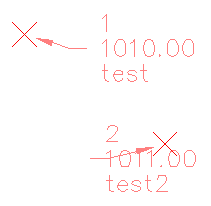 When in a Dragged State the attachment point for the leader is aligned toward the exact insertion point but trimmed back to the “limit” of the Marker assigned in the Point Style. There is a Border and Leader Gap setting in the Point Label Style > Dragged State Tab but that only increases the gap between the landing line of the leader and the text. (Revised Statement) Thanks to Nick at my Civil 3D Workshop yesterday. The leader has 2 position choices controlled by 1 setting in the Point Style. On the Summary Tab > Marker (Property) > Leader stops at marker. Set to No and the arrowhead goes directly to the insertion point. Set to Yes (default setting) and the leader stops at the perimeter of the symbol. Offset parameters for the arrowhead do not exist. Is there a way NOT to have the color switch to “bylayer”? I have a point label that displays coordinates, northing stacked above easting with a line separating them. If I have the drag state set to “as composed” everything looks fine until I drag the label to the left. If I switch the drag state to “stacked” and drag the label the leader switches sides (as it should) but I lose the line component and lose the ability to rotated text. Hi Greg, that stacked behavior is a limitation with label styles. My best work around is to create another label style with right justified text and set its drag mode to “as composed”. The components in the label style when set to “stacked” are displayed in the order they appear in the drop down list. There is no way (as of 2017) to change the order other than redefining the components in the correct order.